Can we get a drumroll, please…… Introducing Toy Gen 童真社! Right out of the park are Eddie Cheng and Alvin Fung launching their brand with two figures! 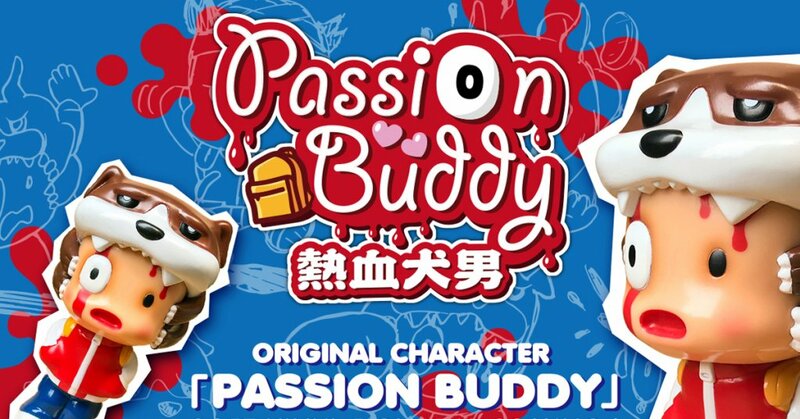 Meet PassionBuddy and AlieNut! Two different soft vinyl figure indeed. Heres what Eddie and Alvin had to say about the brand and PassionBuddy and AlieNut. The two designers who lead the game are themselves players who collect toys of all types. We start the creation of our own brand. After having enjoyed different designer toys, it’s better to think about designing something. Each has its own favourite type of toy, and the design ideas will not be the same. Conceiving eccentric, interesting, cute and fantasy themes, like our Chinese brand name, we must also remember innocence. We hope that players will be satisfied with the quality of our products and that we want to do! One dog and One boy every day live a noisy life! The design concept comes from dog owners who are enslaved by pets! The design concept comes from an attractive donut. The appearance of change is not only image, in fact, will there be alien creatures like it? Alien-life plans to immigrate to the earth and parasite in a donut. They can enter the human body. They wants to controls opinionated earthly people. Where exactly does he come from? And how many people on earth have been controlled by them? We’ll be honest we’ve seen many figures very similar to AlieNut over the years, not to say that it isn’t cool but Eddie might want to get into something a little bit more unique that’s our own opinion.